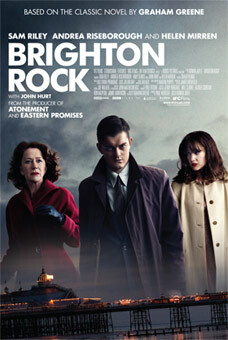 Brighton Rock tells the story of a low-ranking teenaged criminal, Pinkie (Sam Riley), who is determined to prove himself to the other gangsters of an organized crime ring and position himself as their leader. Innocent and naïve waitress Rose (Andrea Riseborough) links this stranger to a local murder and Pinkie sets out to seduce her into silence. Rose’s protective boss and boss’s close confidant (played by powerhouse pair Helen Mirren and William Hurt) are observers to the unfolding situation and they try to prevent her from falling for Pinkie, who is in over his head. Because of her commitment to her faith, she refuses and quickly falls under his influence—effectively setting the mood for the peak of the film. Based on the classic 1938 novel by Graham Greene, it’s hard not to compare first-time director Rowan Joffe’s adaptation to Greene’s book or the book’s first film adaptation in 1947 (which starred a young Richard Attenborough). The film is fine where it is, but my frustration comes with the potential of the movie that wasn’t reached. Though styled as a film noir or neo-noir, the film highlighted too much visual pizazz and not enough depth of intended subject matter. It could’ve been more, but Jaffe doesn’t take us all the way there. The melodrama seemed a little heavy-handed at times and relied too much on film-school trickery. The lighting and set, on the other hand, were extremely well-done and appropriate for the tone of the film, creating a perfectly eerie and enveloping visual presentation. The era-shift from 1930’s to the 1960’s was a clever decision on the part of Joffe, but the switch lent itself more to aesthetics than to furthering character development or adding anything new to the complexity of the plot. During a time of unrest in London’s resort towns, the oft-shown riots of the film, based on Britain’s “Mods and Rockers” riots, didn’t garner much explanation. Knowing about the time period helps the viewer to see how the plot does falls comfortably within this socio-historic narrative. Of course the movie doesn’t have to be such a literal interpretation of the novel, and I appreciate the modern take and era adaptation, but the movie doesn’t do enough to justify itself in terms of creating a fresh take on the original. Joffe does do a great job of exploring elements of dark vs. innocence and right vs. wrong, as represented by the main couple of the film; however, in the novel, Greene tackles the philosophical theme of religious belief vs. skepticism as well. The movie doesn’t delve into this religious topic much passed visual cues of things like crucifixes or Rose’s hesitation in leaving Pinkie. This is really where the core of the book grabs the reader and engages them in thought and feeling—the characters were driven by their beliefs. The lack of religious backdrop in the movie often pulls the viewer away from the story, leaving viewers to wonder what each of the characters’ motives were for their actions. For this reason, sympathy wasn’t developed fully for either character and I didn’t care as much about what happened to them. I would’ve liked to see more of Pinkie’s panic and realization that he got himself deep into something that he doesn’t know how to pull himself out of. His fear of eternal damnation should have played a larger role in the plot, but the absence of this point leaves little explanation of the character’s actions. Similarly, Rose’s dedication to her faith kept her from straying from the love she felt for the mobster. We fail to see these characters’ internal conflict between their beliefs and actions, which would have given much greater purpose to the film, its mood, its purpose and its significance. Still, the movie, for what it was without comparison to its predecessors, was engaging—cinematically breathtaking and lusciously dramatic. Mirren, as always, delved into her character’s persona—an Auburn-haired British floosy with strong morals. She was believable and I wish there was a bit more of her in the movie. 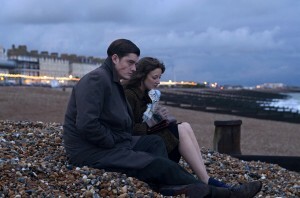 Rising star Andrea Riseborough gave a very convincing performance—one that made me look her up after seeing the movie. A movie that had so much promise, and lived up to a great deal of it, also fell short in its character development—a flaw that was detrimental to the final result of a still-captivating and visually-stunning thriller.